MOSCOW, Idaho – Eleven recent University of Idaho football players trying to impress about 20 NFL scouts at the UI Pro Day Thursday at least convinced the NFL visitors they can play late in the season in inclement weather. Snow mounds surrounded the practice field, and a biting wind and occasional rain met the players when they moved from the weight room to the adjoining field to run 40-yard dashes, 60-yard shuttle runs and three-cone drills and do position work. Defensive linemen Arie Anderson and Aikeem Coleman and offensive tackle Jordan Rose were the only linemen to work out. The remaining players were wide receivers, running backs and quarterback Matt Linehan. Linehan missed Idaho’s last three games with a hand injury, but he appeared fully recovered as he threw short, intermediate and a few deep routes. He was watched by his father, former Vandals quarterback and current Dallas Cowboys offensive coordinator Scott Lineman. While he has been training in Florida for NFL tryouts, the Idaho pro day was Linehan’s first opportunity since he was hurt to throw passes with something at stake. “It’s been a long time since I was in a setting where I have been in front of people throwing,” Linehan said. “Last time was Nov. 2. I was at (University of) Troy, and I’ve been itching to get back ever since. No official 40 times were released. Following a lengthy warmup, wide receiver Reuben Mwehla ran one in approximately 4.4 seconds. He was exceptionally quick off the starting line and ran with a low body lean the entire way. Mwehla also displayed a 41-inch vertical leap. Jacob Sannon averaged 4.54 for his two 40 attempts. Sannon and Mwehla each got 16 reps in the 225-pound bench press. 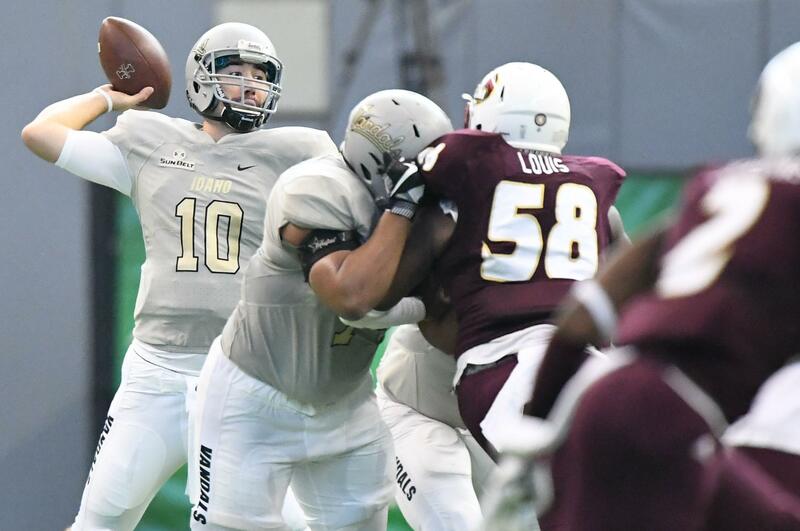 Sannon and Deon Watson, who finished his career at Idaho in 2016, caught everything Linehan threw them, as did running back Aaron Duckworth, the Sun Belt Conference rushing leader last season. “To see these guys come back in really good shape and run the routes was exciting,” Linehan said. Linehan admitted to being “a little jittery” for the first few throws, quick darts to receivers and Duckworth coming off the line. But he quickly settled down. For a quarterback, this was what pro day is all about. Published: March 8, 2018, 9:28 p.m. Updated: March 8, 2018, 11:03 p.m.